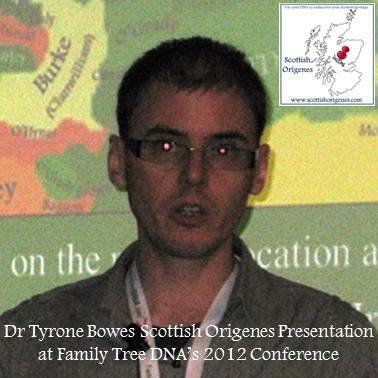 I was invited by the world’s largest commercial ancestral DNA testing Company 'Family Tree DNA' to give a talk entitled 'Pinpointing a Geographical Origin' at their 8th Annual Genetic Genealogy Conference in Houston, Texas (Nov. 2012). I may be biased in my opinion but I think that the talk was well received. The general impression I got was that many people simply overlook the surnames of the people with whom one shares a common male ancestor as revealed by the Y-DNA 37 test. Those surnames can pinpoint a geographical origin as they (the surnames) will have arisen among a related group of individuals living in a specific location. Given that surnames still concentrate in the area where they first appear one merely has to plot where one's surname matches occur (based on census data) and reveal a common area of association; that will be the area where one's ancestors originated. The method works remarkably well for those with Irish ancestry, Scottish ancestry, but can be that little bit trickier for those with English and Welsh ancestry. In fact in Ireland one can pinpoint an ancestral origin to within a specific townland (these are very small areas, some only a few acres in area). I hope to have a link to the actual presentation shortly. In the meantime one can download and view the slides from the presentation (click here) which feature background information and most importantly Case Studies for those with Irish, Scottish, Welsh, and English ancestry. Since then Family Tree DNA have invited me to give a number of talks at the ‘Who Do You Think You Are LIVE‘ event in February, in London. This event is the largest genealogical event in the World! I have some exciting new Case Studies to detail, so I hope to see you there. If you have had a Y-DNA test and would like to pinpoint an ancestral origin, and would like a FREE CONSULTATION then you can contact me here.